Sri Lankan Prime Minister Ranil Wickremesinghe's recent visit to Australia gives us an opportunity to learn more about Sri Lanka than its treatment of returned asylum seekers. In particular, Sri Lanka can provide valuable lessons on how small states are responding to the growth of a multipolar Asia. In the last decade, Sri Lanka has taken a non-ideological, interests-based approach which has kept Great Powers like China, the US and India on their toes. When the Rajapaksa government decided to definitively end the country's almost three-decades-long civil war through a no-holds-barred military assault, it received insufficient assistance from the West and big neighbour, India. Shedding no tears, the Sri Lankan government promptly went to China who was quick to assist, providing of $USD37 million in ammunition and ordinance, and six F7 fighter jets. While the US, when Hillary Clinton was Secretary of State, reduced aid and criticised Sri Lanka's conduct of the war, China, alongside Russia, opposed the UN Security Council being briefed on the issue. The period also saw massive Chinese aid and investment, with Beijing becoming Sri Lanka's biggest donor. China invested $1 billion into a deep-water port at Hambantota in the island's south and lent Sri Lanka hundreds of millions to build a second airport, a new railway, and the Colombo Port City Project – touted as the largest infrastructure project in the country's history. Of course, these projects had massive strategic benefits for China. Supporting Colombo's war effort demonstrated to both the Sri Lankan population, and the region's small and fragile states, that Beijing is a partner who won't let you down. Furthermore, Sri Lanka sits at the heart of the Indian Ocean, the site of potential future Great Power contests, adjacent to the main sea lines of communication linking China to its energy sources in the Middle East. Having access to, and intimate knowledge of, the Hambantota harbour and airport provides Beijing an important military staging area in the event of an Indian Ocean conflict. It is a key link in its ‘One Belt One Road' initiative. Chinese submarines even docked in Sri Lanka. Much of this was to the chagrin of India which maintains a doctrine of preventing other Great Powers entering South Asia and seeks to maintain influence over Sri Lanka – another reason Colombo welcomed Beijing's engagement. There were economic benefits for Beijing too, much of which came at Sri Lanka's expense. It is here that Sri Lanka may provide an example of what not to do when dealing with China. Colombo's economic interactions with Beijing left the country in $USD8 billion in debt, thanks in part to extremely high interest loans for projects that provided little short to medium-term economic gain. While the economic engagement with Beijing may still have been worth it, given the costs of war that would have dragged on for longer if China had not assisted, the ‘bad deals' made with China were used as the platform for a domestic political attack by the opposition, who subsequently defeated the Rajapaksa government. The new administration under Maithripala Sirisena publicly rebalanced toward the West and India. It declared no more Chinese submarines would visit Sri Lanka's ports and Indian Prime Minister Modi and US Secretary of State John Kerry both visited the island. More recently, however, Colombo has reaffirmed that its relationship with Beijing is valued by both sides of politics. Ceremonies were held to mark China's development of a 15,000 acre industrial zone. A deal was also struck for Beijing to swap the debt for 80% equity in the Hambantota port. 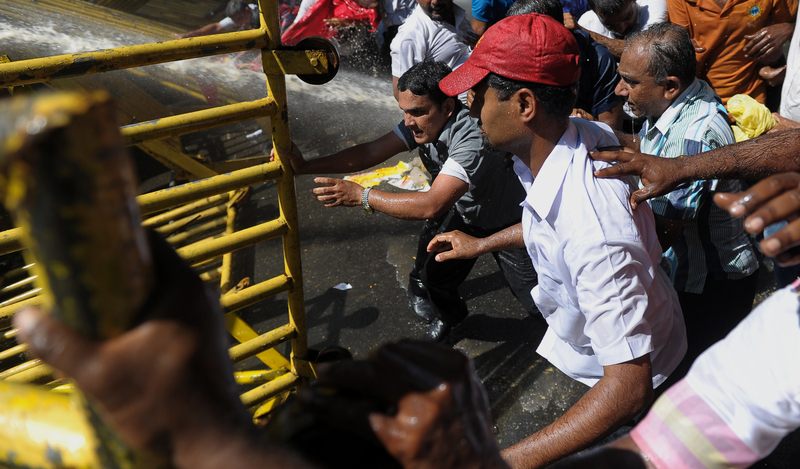 These recent initiatives have, however, been delayed due to protests – including by supporters of former President Rajapaksa. The recent deals perhaps reveal the genius of Beijing's own strategy – that no matter which party comes to power in Sri Lanka, China will have access to the harbour and airport in event of a regional conflict. For its part, Colombo will likely see Beijing's reliance on Sri Lanka's assets as an insurance policy against any future insurgency or pushiness from India. While at times Sri Lanka's relations with great powers have been the product of short term domestic political interests by the government of the day, they have primarily reflected strategic interests rather than ideology or sentimentality. Sri Lanka's leaders have rebalanced as they have seen fit and, in doing so, have managed to extract important gains from great powers, despite making significant mistakes along the way. Colombo recognises that great power-small power relations are, in some ways, returning to the situation during the Cold War – when small states were not so much at the mercy of big countries because they could always turn to the other bloc. Sri Lanka provides Asian countries valuable lessons through its manoeuvring. This was facilitated by Colombo's non-aligned political culture, forged in the fires of the anti-colonial struggle. Today a significant portion of the Sri Lankan population is fiercely supportive of an independent foreign policy - an approach that, if managed properly, can lead to security and prosperity in an increasingly turbulent multipolar world.